Introduce Yourself: If you see someone in the kitchen, elevator, or at an office holiday party or happy hour, take a moment to introduce yourself and initiate a conversation. This does not have to be a long-winded conversation; in fact, it could last only a few moments, but it is important to take this first step. In essence, don't be afraid to make the first move. Meeting new people can be uncomfortable, and some people are more hesitant to initiate conversation than others, but it is an invaluable skill to have. If you can force yourself to be outgoing and ask the person a few questions, you will quickly start to develop new relationships with the people in your office. Once you've completed this first (and likely the hardest) step-the introduction-your work is still not completed. It is important to continue to build that relationship, and like any relationship in your life, they all require effort. On the upside, as you slowly start building relationships with various people in your office, these conversations will become easier and easier, as the topic of conversation will be much more likely to flow, as it is more organic now that you have developed a foundation. It's a good idea to make time to engage with your colleagues throughout the day. Support Your Colleagues: Everyone likes to hear that they are doing a good job, and showing true appreciation for someone's project will go a long way towards strengthening your relationship with that person (as long you're sincere, that is). Offer Your Assistance:Share information with your colleagues. 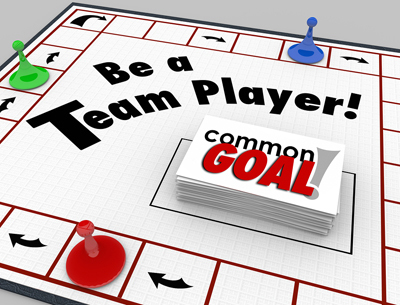 Consider yourself part of the team, and try to be a "team player" whenever possible. People will start to trust you, and they will come to you when they need assistance. This alone will form strong relationships, as you will start to trust your colleagues as well, and you will also find that it is easier to get to know him/her when you're working on a project together. On that same note, don't be afraid to ask your colleagues for advice or for help with a specific project. Participate in Activities: Everyone tends to be less harried at happy hour or the office holiday party, when there are no deadlines looming everyone's head. Listen to People: Active listening is a skill that takes time to develop, and surprisingly, there are some people who have not yet mastered the art of active listening. In order to develop a strong relationship with your colleagues, you will need to be able to actually listen to what they have to say. Participate During Meetings: Share information about yourself (when it's appropriate, of course). One of the best ways in which to develop a relationship is through sharing personal information about yourself, as people will not only learn more about you, but they will also see that you are approachable. This will increase your opportunities to develop relationships with many people in your office. Remain Positive: Everyone is attracted to positive people, as they are easy to be around. Also, let's face it, positivity is contagious. Being a positive person will help strengthen all of our relationships in the office. Bottom Line: Developing and maintaining strong relationships with your colleagues has many benefits including an increased amount of resources (and thus increased productivity and efficiency), as well as an overall increase in job satisfaction.